Here are a few photos from the solemn Mass on the Friday of the CIEL 2006 conference at Oxford. You can enlarge any of the photos by clicking on them. If you need a version of any of the photos in higher resolution for any good purpose, please contact me by email. 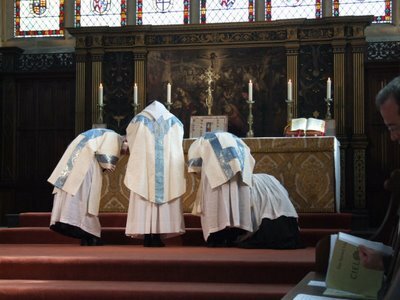 Ego volo celebrare Missam iuxta ritum sanctae Romanae ecclesiae, ad laudem omnipotentis Dei, totiusque ecclesiae triumphantis, ad utilitatem meam, totiusque ecclesiae militantis, pro omnibus qui se commendaverunt orationibus meis in genere et in specie, ac pro felici statu sanctae Romanae ecclesiae. "I intend to celebrate Mass according to the rite of the holy Roman Church, to the praise of the almighty God and of the whole Church triumphant, for my benefit and that of the whole Church militant, for all who have commended themselves to my prayers in general and in particular, and for the happy estate of the holy Roman Church." 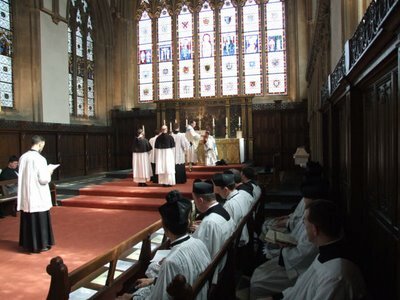 Here is a view of the celebrant and ministers preparing for solemn Mass for the feast of Our Lady of Sorrows, in the ancient chapel of Merton College, Oxford. 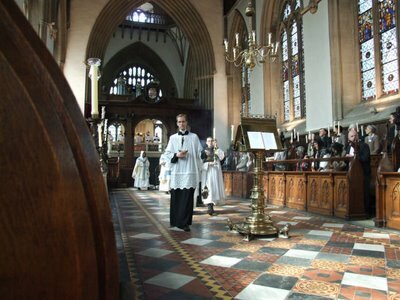 Preparations now complete, the procession makes its way towards the screen at the entrance of the quire. 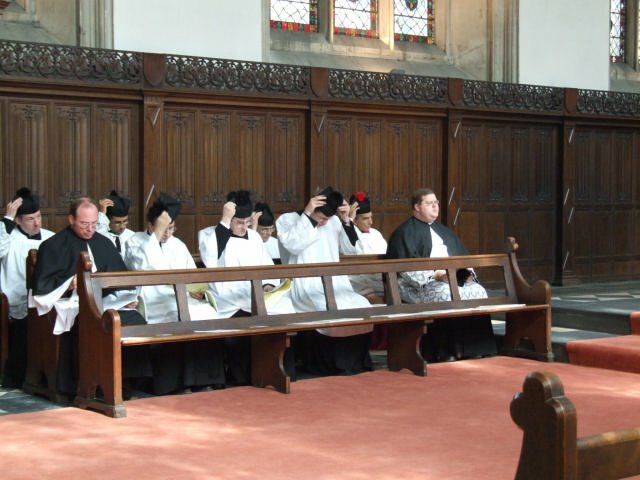 On the right is Richard Luzar who loaned the vestments that were used at the Mass. 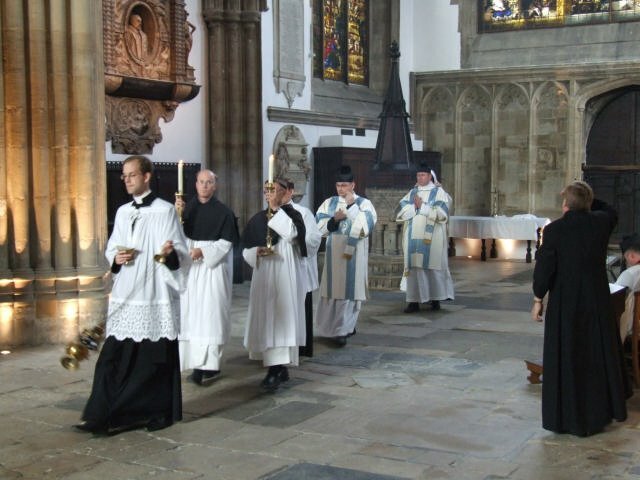 Led by the thurifer,the procession enters through the quire which is packed with the participants in the CIEL 2006 conference. Confiteor ... et tibi, pater (I confess ... also to you, father). 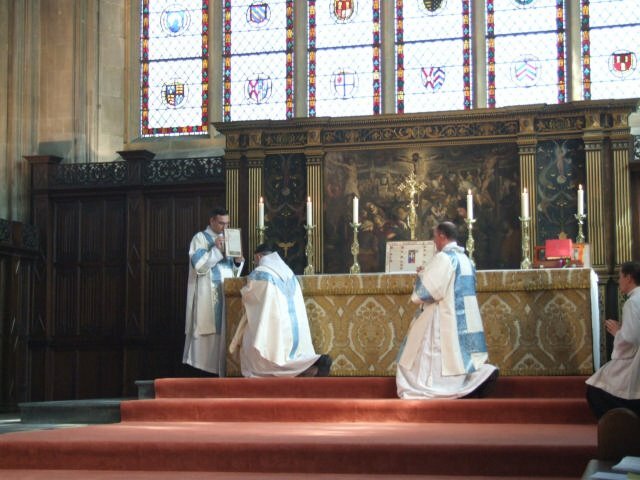 The Deacon and Subdeacon recite the Confiteor on behalf of the people present, turning to the celebrant as they confess to him (in addition to Our Lady, St Michael, St John the Baptist, St Peter and St Paul and all the saints). Stabat Mater dolorosa, iuxta crucem lachrymosa... (The sorrowful mother stood tearful by the cross.) 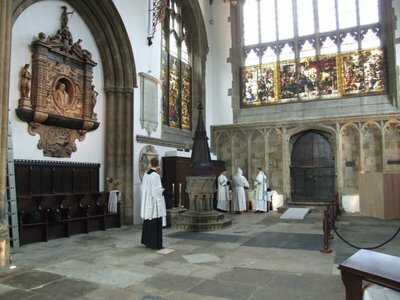 As the sequence for the feast of Our Lady of Sorrows comes to an end, the procession forms for the singing of the Gospel. Jesus. The clergy in choir remove their birettas as the Holy Name of Jesus is pronounced during the sermon. 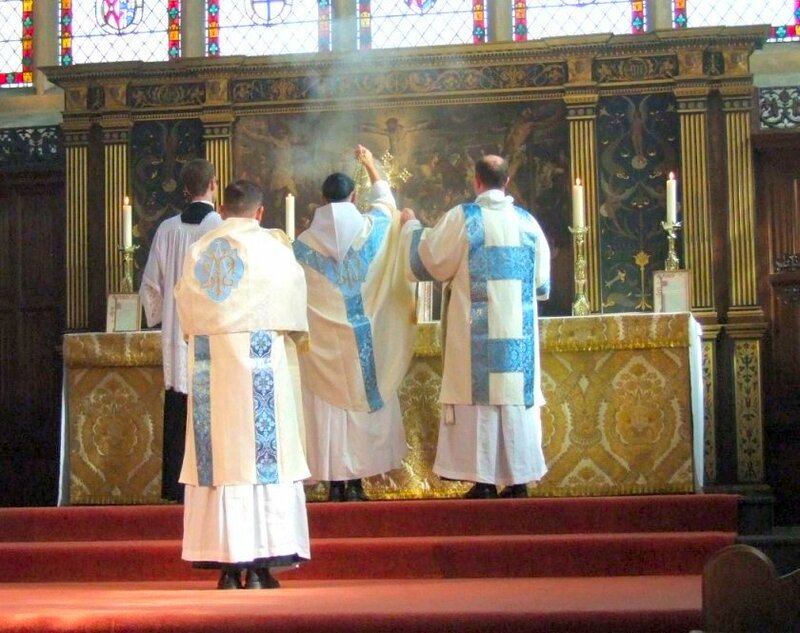 Dirigatur oratio mea sicut incensum in conspectu tuo Domine... (May my prayer arise before you like incense, O Lord.) The celebrant incenses the offerings, the altar and the crucifix. My Lord and my God. 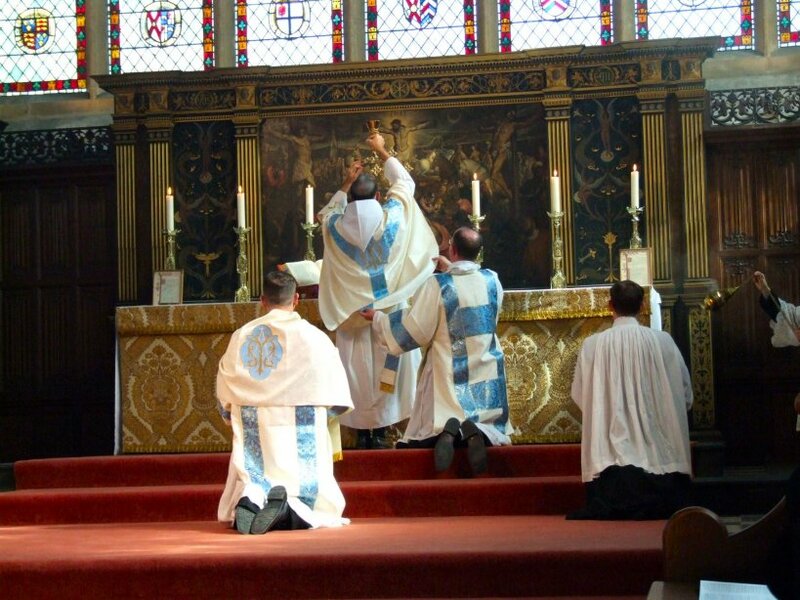 After the consecration, at which the bread and wine are changed and become the body, blood, soul and divinity of Our Lord Jesus Christ, the celebrant elevates the sacred chalice for our adoration. The Deacon holds the chasuble to allow him to raise his arms. Et Verbum caro factum est The celebrant and Deacon kneel at the words "And was made man" during the Last Gospel. 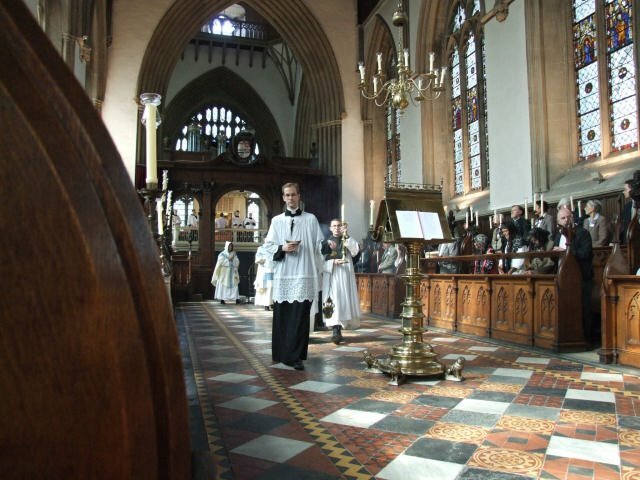 The subdeacon hold the card for the celebrant to read.